Atlas Copco, a leading provider of sustainable productivity solutions, has announced a new addition to its award-winning range of rugged and lightweight 8 Series compressors. The XAS 88G combines a reliable source of compressed air with a 9 kVA built-in generator, said a statement from the company. The pioneering concept of the latest model, and all machines in the 8-series compressor/generator combination range, are designed to optimise fuel consumption in-line with load demand, it stated. 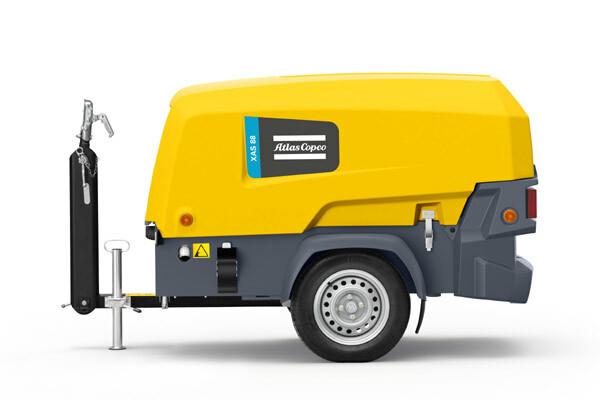 Atlas Copco said the XAS 88G was also equipped with an alternator that delivers 100 per cent imbalance in single phase mode, and a rotary screw compressor element that produces 7 bar (100 psi) air at a Free Air Delivery (FAD) rate of 5 m3/min (175 cfm). Furthermore, the machine is driven by an economical, quiet and emission-controlled Kubota engine that produces 33 kW at normal shaft speed. This combination offers end users the capability to power up to three pneumatic tools and two electric tools in semi-simultaneous mode, enabling selection of air supply or power output to match on-site needs, it stated. Unveiling the product, Hendrik Timmermans, VP of Atlas Copco Portable Air division, said: "This technology means end users benefit from full-shift fuel economy, even when all sockets and outlets are in operation. There are a number of key applications where the presence of an on-board generator adds real value to our customers by minimising the amount of equipment they need to take to site and ensuring they’re never without power." "Easy start-up, safety and security are defining features of the machines, which are designed for use on construction and work-sites around the world. For instance, the starter motor protection and anti-air lock system features guarantee easy starting. Meanwhile, for added safety, a battery cut off switch is provided with IT relay functionality as standard; meaning there is no need for extra earthing protection," he added. The new product is available with two generator output options, depending on the operator’s region of the world. It comes in a 230/400 V version with three weather-protected power sockets: 2 x 400V 16A and 1 x 230V 16A, along with a 4P 13A circuit breaker. Alternatively, an 110V version is available with three power sockets as well: 1 x 110V 63A, 1 x 110V 32A and 1 x 110V 16A, along with a 2P 63A circuit breaker. Protection and easy access to all main components is via the rugged HardHat hinged canopy. Additional protection for the unit and operator investment is assured by the strong spillage-free frame, single sheet steel, non-welded undercarriage construction and three-layer anti-corrosion paint system. The 8 Series range also features a guaranteed service time of less than 60 minutes. Furthermore, service is only needed, on average, once every two years. In addition to the XAS 88G, there are two other machines in the 8 Series compressor/generator combination range: the XAS 48G that produces an FAD of 2.5m3/min (90 cfm), and the XAS 68G that delivers 3.5m3/min (125 cfm) FAD.